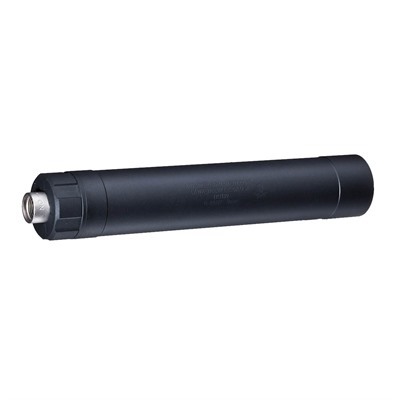 The Ti-Rant series are ultra-high performance silencers for 9mm & 45 Auto handguns. Advanced material selection gives the Ti-Rant series unequalled durability despite compact dimensions and lightweight construction. The fully serviceable design enables users to remove the SCARmor coated 17-4PH blast baffle and hardcoat anodized 7075-T6 aluminum baffles from the Grade 9 Titanium tube for cleaning and maintenance using the supplied end cap spanner. The highly evolved "K" baffles used in the Ti-Rant series deliver class leading performance when shot dry. For added sound and flash reduction, a wet charge of 5cc's of water will increase performance by up Mfg: Advanced Armament SPECS: Caliber - 9mm. Weight - 8.6oz. Length - 7.75". Diameter - 1.38". Materials - Grade 9 Ti, 7075-T6 and 17-4PH. Finish - Cerakote. Attachment - Direct Thread (1/2-28). Reduction Dry - 34 to 38dB. Reduction Wet - 41dB.